Why Partner with Natural Nutmeg Magazine? Write and submit your own articles building your reputation as an expert – WHAT?!? Have you ever heard of another publication that offers this? Facebook & Instagram making you crazy? We got you – FREE promotion on any of our social media sites linking to your website. Struggling to build an email list? CHECK! – FREE monthly eblasts to our entire list of 25,000 practitioners and readers. Capitalize on the thousands of people that visit WWW.NATURALNUTMEG.COM each month by featuring a banner ad linking to your website. Sell out your event with free listings in our Happenings Monthly Event Section in print. Network with other holistic businesses, PR and social media experts, web developers, graphic designers and marketing consultants to build your business. Natural Nutmeg has over 20 years combined experience in amplifying our client’s brands and driving their businesses to new heights and we’re the only print magazine in Connecticut that devotes all of its editorial, content and advertising exclusively to local natural and holistic practitioners and businesses. Our team forms a true partnership with you to elevate your image and empower you to reach your true potential. Now in its 10th year of publication, Natural Nutmeg Magazine is THE local resource for health and environmentally conscious readers who desire a holistic, natural lifestyle and the advertisers who want to reach them. The magazine offers cutting-edge, timely information on natural health, wellness, green living, nutrition, fitness and organic products and is a free monthly publication distributed throughout Connecticut. 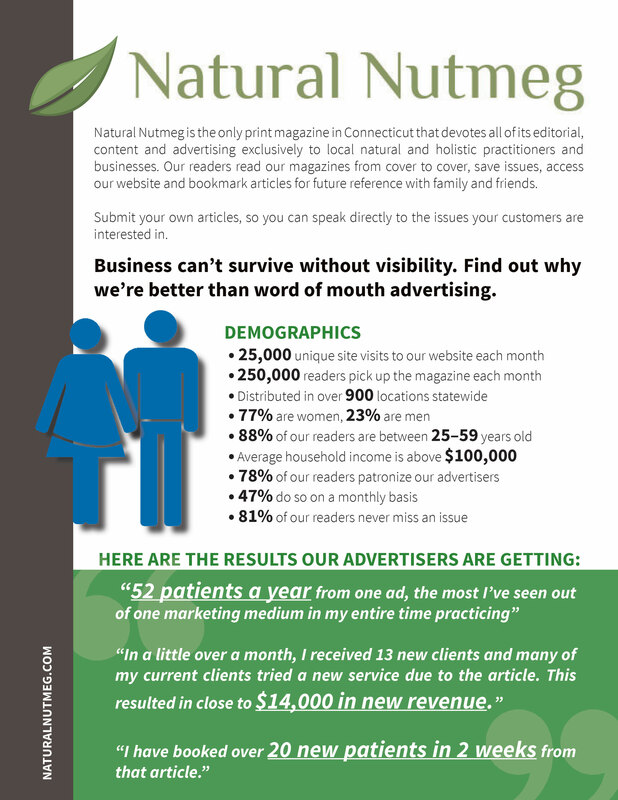 Over 250,000 readers pick up Natural Nutmeg each month, making it the perfect place for you to introduce your specialty or a new modality, brand your practice or business, or simply sell a product or service. Most readers say they read the magazine cover to cover and they keep all of our issues for future reference. Click HERE to see additional Demographic information. “52 patients a year from one ad, the most I’ve seen out of one marketing medium in my entire time practicing. As you know I refer all new practitioners and natural businesses to the Natural Nutmeg because it’s been one of the cornerstones to building my practice. I have taken exercise classes, gone grocery shopping and even at parties had people recognize my face from the Natural Nutmeg magazine. Because this magazine is so supportive of the local natural community, advertising with them makes it easy to become a personality within the community. I’ve had oncologists, gastroenterologists and other conventional practitioners mention reading my articles as well. “As a result of my exposure in Natural Nutmeg I am receiving an average of 25-30 calls per week for patient appointments and workshop attendance. This more than pays for the cost of my ad. I would highly recommend advertising in Natural Nutmeg. “I have been advertising and writing for Natural Nutmeg for over 5 years now. I consistently get patients who tell me it is where they found out about Naturopathic medicine and my office. The March 2013 issue of the magazine had an article I wrote about autoimmune diseases. I received the biggest response in the shortest amount of time. I have booked over 20 new patients in 2 weeks from that article. And one new patient from an article I wrote for the magazine well over a year ago. Of all the marketing media I have tried, advertising and writing for Natural Nutmeg is by far the most effective. “I have been an advertiser with Natural Nutmeg magazine for over 4 years and recently placed an article in the magazine as well. The response from one article and my consistent advertising in Natural Nutmeg completely exceeded my expectations! In a little over a month, I received 13 new clients and many of my current clients tried a new service due to the article. This resulted in close to $14,000 in new revenue, not to mention the potential in referrals and ongoing revenue that this will generate in the future. Our role is simple….We educate target audiences and move them to act! Please supply your name, phone number, email address & a little information about you below. What is the biggest challenge you have with marketing your business? What has and hasn't worked for you in the past?